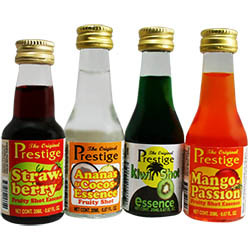 The Prestige assortment of Fruity Shots & Aperitifs with higher quality than dissolved Candy. These are the sweetest of essence and are to be mixed with Sugar and Liquor for a wonderful and rich experience. There is no need to like Candy to enjoy the sweet taste of our Candy Shot essences.